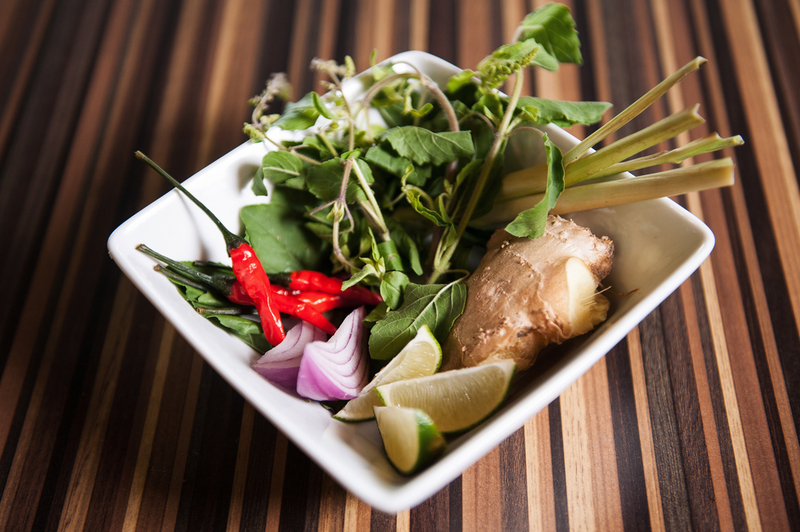 Thai food is known for its enthusiastic use of fresh (rather than dried) herbs and spices and Chef Aung insists on freshness and quality in all of his dishes. Chef Aung Kyaw has nailed the complex alchemy of weaving together all of the rich southeast Asian flavors: the sweetness of coconut milk, the tang of curry, the fire of chiles. 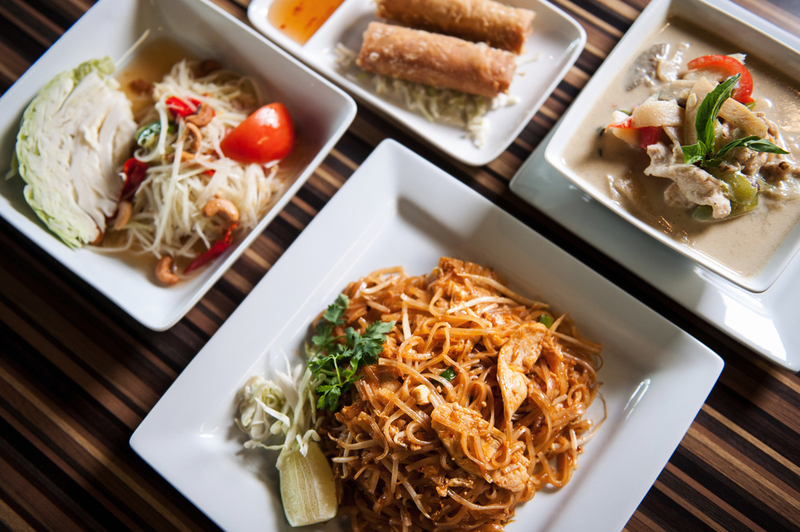 Thai Iced Tea and Coffee, traditional Thai Singha or Chang beer, white or red wines, other Gluten-free options, Perrier, soda, and even juice boxes for the kids - there are plenty of delicious options to complement your meal. Aung Kyaw (pronounced "ung joe") is a refugee from Myanmar (Burma). Burma sits geo-graphically next door to Thailand. Due to human rights abuses against ethnic tribal people in Myanmar, many walk out of their country to escape. Aung left his family in Burma, walking out, to Thailand. Once he reached Bangkok, he met the Chef of a Five Star Restaurant and Hotel. The Chef took him under his wing and taught him his culinary skills. Aung mastered those skills. When he arrived in the US through the United Nations refugee program, his dream was to start a restaurant in America. That was 11 years ago. 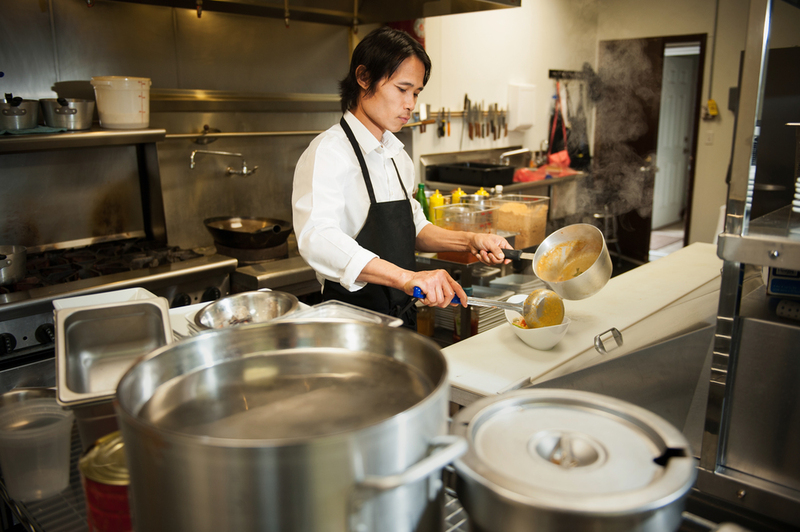 Since then, he has cooked at many Thai restaurants in the U.S. His passion for cooking is relentless. He insists on fresh and quality ingredients only. His recipes are authentic Thai. 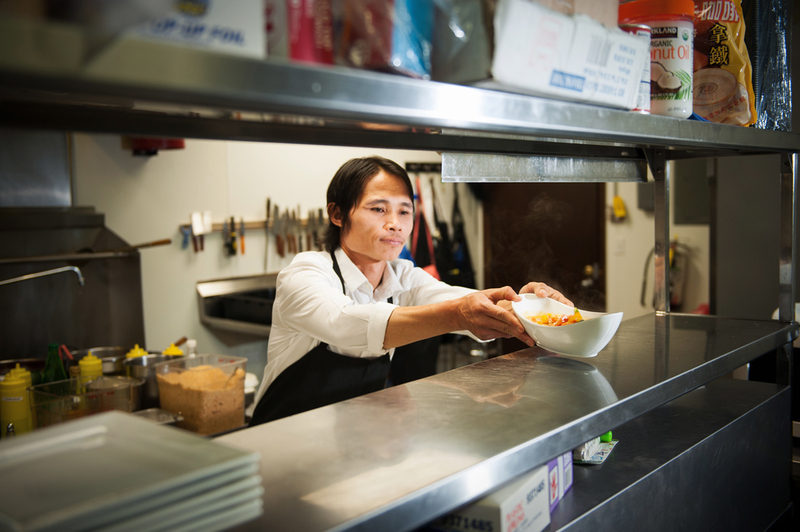 Aung's lovely wife, Mu Mu, supports his culinary ambitions and works with him in the kitchen. They have a 9 year old son, Jason Kyaw. - by Michele and Pat Mangan, Aung and Mu's American "parents", and Jason's "grandparents"! We are proud to partner with Aung in this venture! 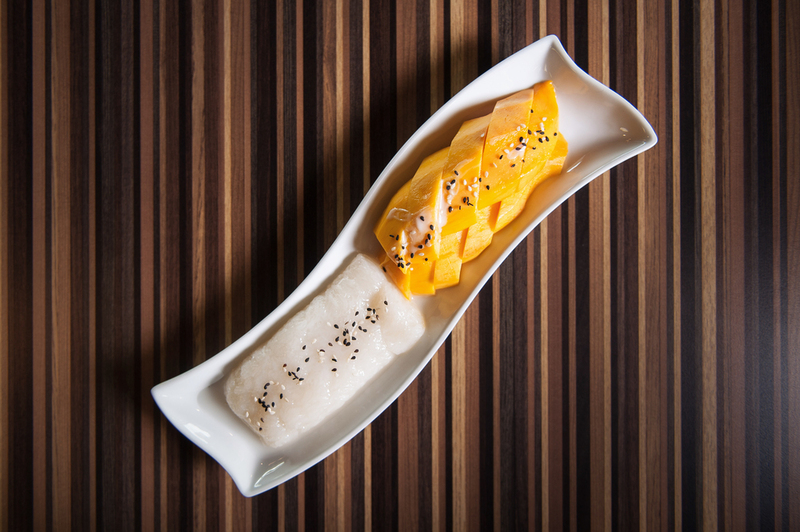 Chef Aung Kyaw has spent plenty of time around Thai cuisine. Not only is he a master of balancing the components found in every traditional dish, he also cooks with fresh, quality ingredients and brings textures to life. From the amount of spice to the crunch of a carrot, Kyaw has the entire spectrum covered. 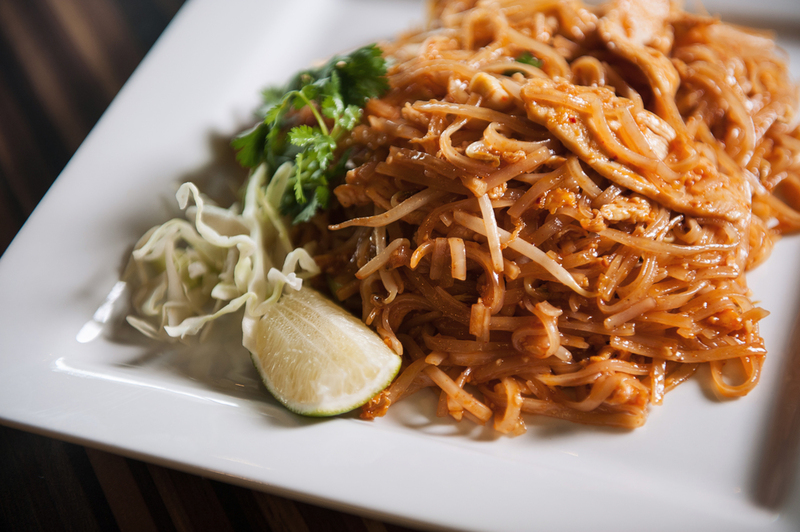 The chef’s pad thai features succulent shrimp and small strips of chicken on a bed of rice noodles, complimented by an aromatic peanut sauce and a wedge of lime. However, no amount of earthy peanut sauce or tart citrus can extinguish the red chili flakes burning underneath the unassuming noodles. Not to be outdone, the paneng curry is flush with smoldering, complex flavors. The paneng’s gravy-like broth uses a subtle mixture of basil, peanut and sweet coconut milk to invite the senses inside. A few seconds later, it scolds them for not taking their shoes off with a scalding afterburn of appetizing heat. The best part is the broth makes the meat nice and tender. The heart, soul and passion behind Aung's Bangkok Cafe. Aung's lovely wife, Mu Mu, supports his culinary ambitions and works with him in the kitchen. Aung and Mu Mu's son.